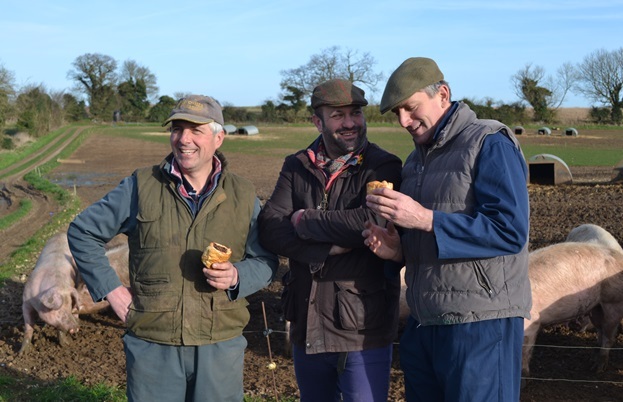 Danny Kingston travels to East Anglia with chef Charlie Hodson to uncover the stories behind the UK’s best sausage roll. Every January for the last few years I have been making a pilgrimage down to the quiet and leafy town of Barnes, West London with one goal in mind: to scarf as many sausage rolls as humanly possible down my greedy little throat. And before you ask, no, there is not a particularly exceptional outlet of Greggs down there. I go there to visit The Red Lion pub, an esteemed establishment where the annual Great Sausage Roll Off is held. It’s a culinary competition that pits chefs from around the country against each other to do battle over pastry and mince (in a kitchen the size of a cupboard) for a trophy assembled from burnished oak and adorned with gold-leafed papier mâché. As nights out go, it is extremely good fun. Particularly for the competing chefs, who, let’s just say, like to let their hair down for the occasion. Nerves are soon washed away with beer, the sound of plates smashing is a regular occurrence and as the night progresses, compere Melissa Cole often has to start bellowing at the crowd to gain any semblance of order. I suspect that when proprietor and landlord Angus McKean first conceived the idea of a #rolloff, he never ever thought things would get so big or raucous. 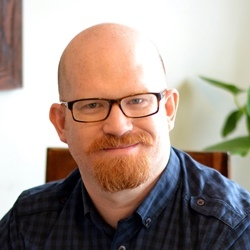 Nor would he ever have the likes of Pierre Koffmann, Dan Doherty, Neil Rankin or Mark Poynton come along, to offer their services as judges for the evening. 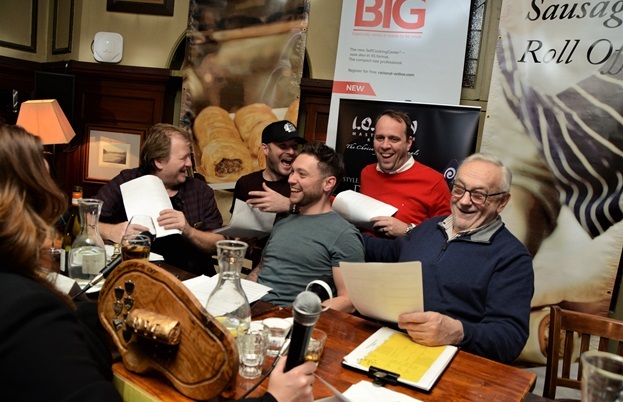 In terms of innovation and quality, the nineteen sausage rolls presented this year were all of the usual high standard (bar a fishy travesty and one or two soggy bottoms). The winner though, Charlie Hodson, a consultant chef from Norfolk and patron of Porkstock, obviously worked out something that his fellow competitors hadn’t. It wasn’t enough to just make a very good sausage roll. To gain an edge, there had to be a cohesive story behind it and for Charlie, he simply had to call upon his friends to help bring everything together. Namely the farmers, butchers and producers that surround him in the eastern part of the UK that juts out into the North Sea. 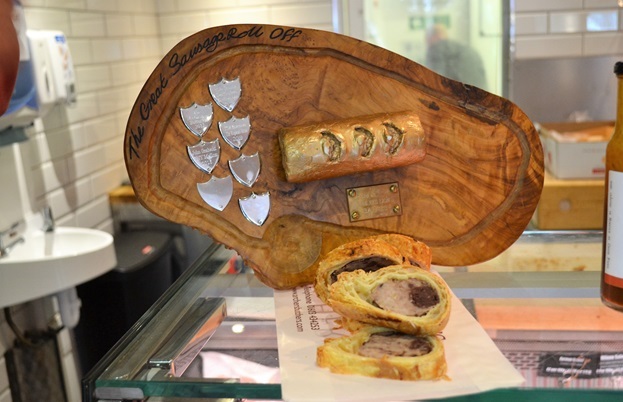 On the night, as he talked about each contributor to his sausage roll, after watching the judges go all dewy eyed and nodding with dreams of provenance, I knew he had it in the bag. And plus, the ‘Nelson’ was pretty damn tasty. ‘I am meeting the girls and boys?’ I thought. ‘What girls and boys?’ And then it came flooding back. An enamoured embrace, complete with handshakes covered in sticky barbecue sauce and a promise to visit as soon as I could. Which indeed happened just recently, when I took in a whistle-stop tour to visit all the people that helped to roll the ‘Nelson’ all the way down from Norfolk to Barnes. Our first stop was at Morley Farm, situated in South Creake near the north coast, to meet Tim Allen and his brother, Phil, who are both fourth generation pig farmers and have a wicked sense of humour. ‘Oi, where’s our bloody sausage rolls?’ was the first utterance to come out of Tim’s mouth on our arrival, and at first, it seemed like we weren’t going anywhere until some were presented. Thankfully, Charlie had some stowed in his car and after an impromptu tasting and assessment (‘decent sussie roll that’) we were on our way. Forging relationships with local butchers, chefs and schools to highlight this ethos with visits to the farm is also paramount for Tim. Without this approach, he said his story wouldn’t get out there. ‘When Charlie won, it was not only a feather in his cap, but it was one in ours too,’ he beamed. Thus highlighting the unknown link that the public often has, with regards to farm to fork. Hopping back to the car, Charlie announced that our next destination was only eighteen miles down the road and it was a necessary stop. Having witnessed the beginning of the supply chain, it was only fitting to see where the pigs met their end; at Blakes of Costessey, the last remaining slaughterhouse in Norfolk. Business, as we should call it, had been finished for the day but it was still good and proper to have a tour, under the guidance of managing director Andrew Clarke. This was not my first visit to an abattoir and the one thing that always stands out is the sense of care and duty that this industry strives for, and Blakes was very much the same. 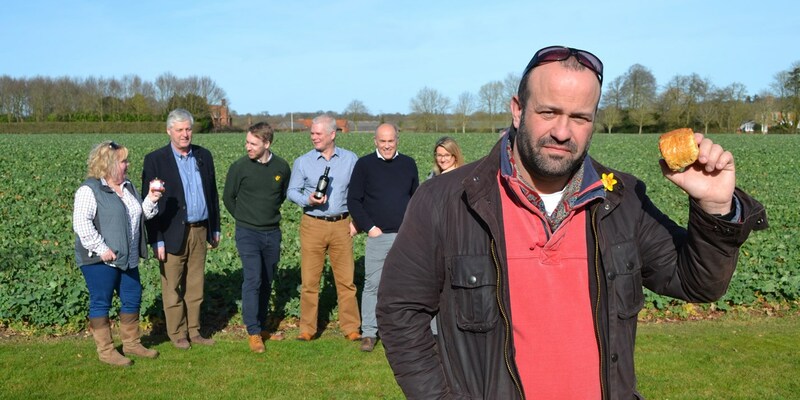 We then hit the road down to the Salle Park Estate, in Reepham, to meet the rest of the producers who all contributed to that sausage roll, along with some other press covering the story. Not everyone could make it down. Letheringsett Mill, who are the only watermill in East Anglia still grinding flour, preferred to keep their dusty noses and hands out of the picture and Emily Norton, of Norton’s Dairy in Frettingham, was unfortunately at a farming conference. Otherwise, I am told she would have loved to have waxed lyrical about the benefits of her butter, made only from double cream and no preservatives, which went into making the puff pastry. On standby though was Dr Sally Francis of Norfolk Saffron, a botanist on a mission to bring saffron back to its rightful home. Intrigued and wanting to uphold Essex’s own historical connection, I asked her where she got that idea from and in a flash, she pulled out a book she had researched and written on the subject of saffron, complete with old maps and tables. Over 200 years ago, as a spice and flavouring, saffron used to be exceptionally popular (on a par with today’s ubiquitous vanilla). But the decline of the rural population and the impact of the industrial revolution soon put an end to that. Sally, given her background, wanted to bring it back to the area and to achieve a premium grade. 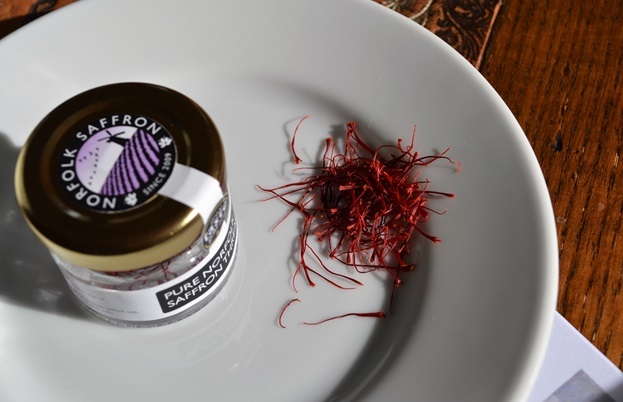 Which she has – her saffron conforms to the highest category achievable. I visibly blinked at all this information, feeling slightly stunned as I stared down into the tiny jar. Probably because her saffron looked and smelt amazingly potent. But also due to the fact that I will always rue the day, that I once spent £20 on a big bag of dodgy stamens in a market in southern Spain. ‘Did the inclusion of the use of your oil in the Nelson make it any healthier?’ I asked him. ‘Possibly, but I wouldn’t eat more than one sausage roll a day.’ Which was not the answer I was really looking for. But there you go. 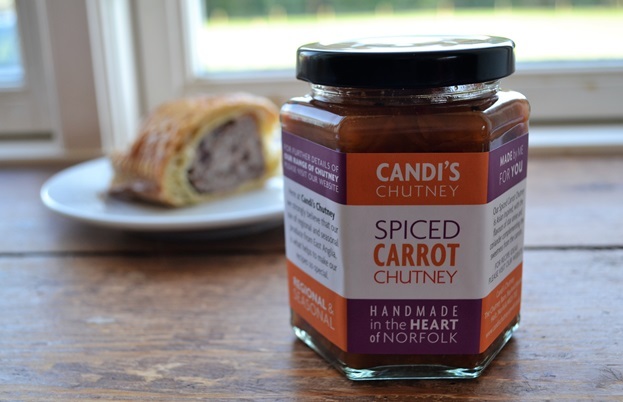 I then got into conversation with chef Candi Robertson, the driving force behind Candi’s Chutney and purveyor of the spiced carrot chutney that went into the mix. 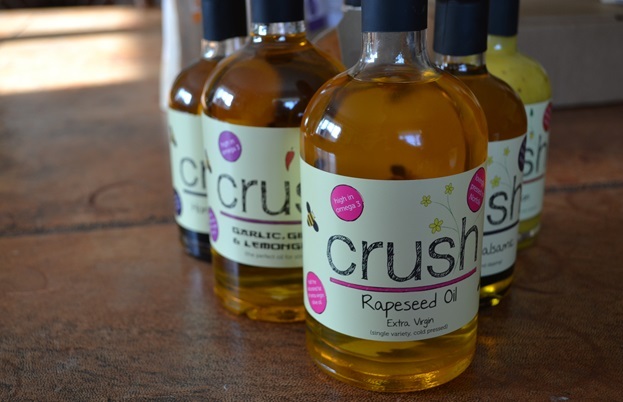 Having seen her award-winning collection that included beetroot, juniper, parsnip and chilli and a very curious sounding ‘Non Mango Mango’ chutney, I asked if she had some big sprawling unit where she executed all these unusual ideas. ‘Nope, I do this all in my kitchen at home, all using locally-grown produce. It was difficult at first but I have got it all down to pat now. I can easily churn out a few hundred jars a day.’ ‘Really?’ I asked. ‘Yeah, I could probably peel and dice 30kg of onions in the time it takes for you do one.’ Now there’s a challenge for you. Or me rather. But should we ever get it set up, I’d rather do it at safe distance from Candi’s swishing blade. There was something steely about the glint in her eye. 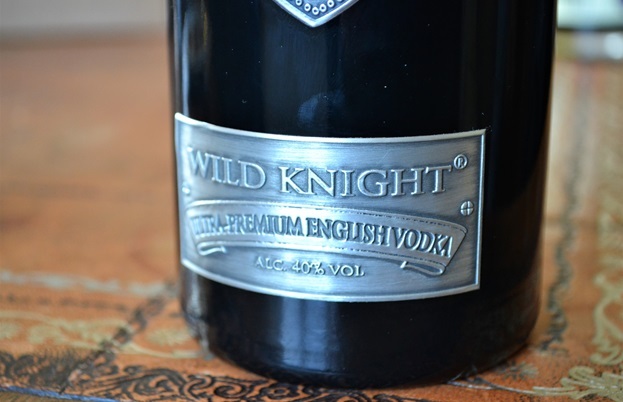 Last of all came a chat with Matthew Brown, who produces Wildknight Vodka with his wife Stefanie, a single distilled vodka made from Norfolk barley. Admittedly, on the night of the competition, I thought that the inclusion of a wee nip served as a sweetener to cajole the judges along. But given the rich, spicy quality of the sausage roll, serving a smooth, long hit of alcohol to cleanse the palate does make sense. Did Matthew ever see his vodka work in that way? No, I did not know this. After the meeting there was one final stop to make – a visit to Archer's in Norwich, for a quick natter with Sarah de Chair, chairwoman of Norfolk Food and Drink. 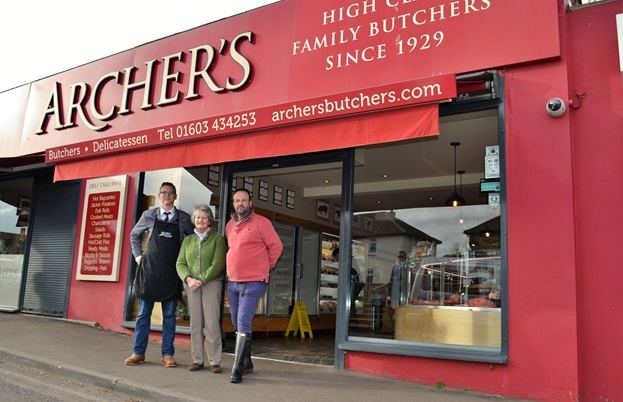 Archers is a third generation butchers that now makes, sells and distributes the Nelson across the county; arguably being the most important cog in this sausage roll making machine. Not only is Jamie Archer responsible for butchering the pigs, adding all the aforementioned ingredients (including black pudding from the Fruit Pig Company) and cooking the sausage roll on his premises; for every Nelson sold, a percentage of the profit gets donated to YANA or You Are Not Alone, a mental health charity that works with farmers and addresses the issue of isolation within the community. When I asked Charlie about it he simply presented a case for paying back into Norfolk and supporting the people that surround him. Given that he calls his merry band his ‘heroes’, it seems apt in some ways that he should be included within that throng. When Charlie first tried to drop me off at Norwich station at the end of the day, having realised that I left my coat all the way, miles back at Salle farm; his insistence to go back and get it certainly singled him out as someone who likes to go beyond the pale. A top chef for winning a frivolous and madcap competition down in Barnes, a champion for promoting local producers and food in Norfolk, or just a hero full stop? Personally, I would say all three.